The term "active directivity" was coined by Mini-Circuits, and it is often a useful parameter in specifying an amplifier. It is a measure of how much an amplifier's source match potentially affects its output impedance, or its load match affects its input impedance. High active directivity is a good thing. 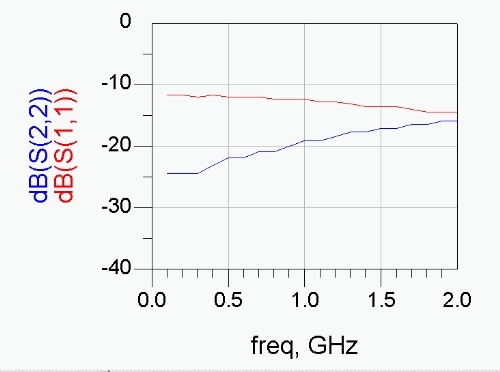 An ideal amplifier is a unilateral device, that is, it has gain in one direction (S21=gain), but has perfect isolation in the opposite direction (S12=0). In reality, you can never create a unilateral device. Active directivity is defined the product of the linear magnitudes of S21 and S12. Expressed in decibels, it's S21(dB)+S12(dB). When is this important? The classic example is when you are designing a receiver; among other challenging specifications, your design might require 1.5:1 VSWR on the output (14 dB return loss). Your block diagram includes an LNA, a mixer, and an IF amplifier. Suppose your mixer has a lousy 6 dB return loss at the output, and you decide to use a cheap HBT amplifier as the IF stage. The HBT amp has better than 16 dB return loss, input and output, so you are guaranteed a good output match on your receiver, right? Wrong! 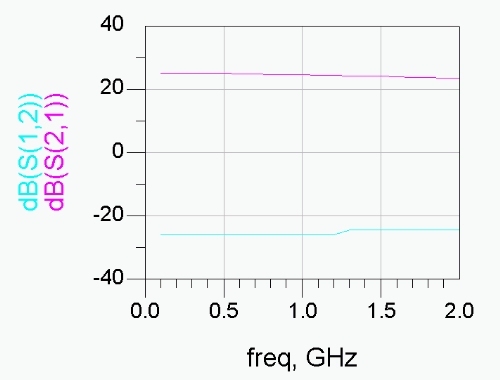 HBT amps have notoriously low active directivity, often just 2-3 dB. This is just an approximation, but, essentially your receiver output will "see" the bad IF match of the mixer, reduced by only 2-3 dB. Only if your amplifier has 20 dB or more active directivity, can you completely neglect mismatches on either port "bleeding through" to the opposite port! Try using TriQuint's TGA8061 in a receiver design. This is an elderly three-stage MESFET IF amp design from the previous century, before HBTs were invented. It has S21 magnitude 8.46, and S12 magnitude 0.0001 at 1 GHz. Do the math, and see that it provides more than 60 dB of active directivity! OK, so its input and output return aren't great (-15 dB and -10 dB respectively), so you might have to add some padding at the output to achieve 1.5:1 VSWR... but you won't have to worry if your mixer has only one dB return loss at its IF port! This was a good example! Here's an example of what can go wrong. We have used manufacturer's S-parameters for this example, downloaded from their web sites, and we used Agilent's ADS to analyze the cascade. Suppose you choose a Celeritek CGB714 HBT amplifier for your IF amp (this is now a MIMIX part, they bought Celeritek a few years ago but you'd know that if you visited our MMIC page). 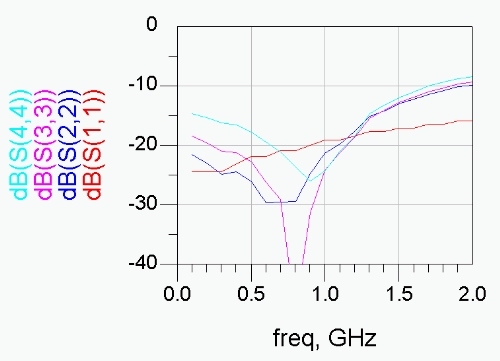 Let's assume your system has 1.0 GHz for the IF frequency, this amp has a really nice output match of 19 dB (the blue trace in the figure below). The input match is not quite as good, but still respectable at 12 dB. Now look at S21 and S12 plotted below. What ho, what do you know, they are almost equal and opposite in dB! Which means very poor active directivity. Now let's examine the IF match of the mixer, which is a function of LO drive (no LO drive means extremely poor match). The three traces below are for 14 dBm (blue), 12 dBm (purple) and 10 dBm (light blue). As you start to starve the mixer, its match gets worse and worse, as expected. Next we have cascaded the mixer and the IF amp, and we are looking at the match at the output of the IF amp. The four traces represent the mixer at the three LO powers corresponding to the plot above, and we threw in a trace representing what you'd see if the mixer was a perfect match (the red line, which is equal to S22 of the amp by itself). Note that at the lowest IF power, the match is only 13 dB. We were shooting for a match of 1.5:1, or 14 dB under all IF power conditions, so this won't do. Gee, what happened to the 19 dB match the amp had??? The final plot shows the IF match with a three dB attenuator inserted between the mixer and the IF amp. It looks great, as good or better than the amp by itself; we have isolated the interactions between the two devices. Why did you think they call an attenuator a "pad?" It cushions some of the sharp edges in frequency response that you might get if you were to package your parts directly next to each other. Of course, you have to worry about the effects that the three dB pad have in terms of system gain, noise figure, and P1dB point. In microwaves, everything is a trade!